48 hours have passed since our crowdfunding campaign began and we can start to sum it up. 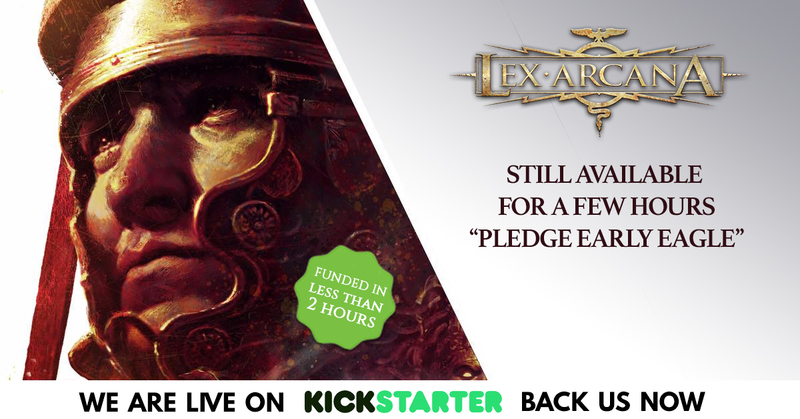 We funded Lex Arcana Second Edition together and unlocked eight Stretch Goals in just two days! We now are a community of more than 800 backers (more than a real Roman Cohors!) and our game is 300% funded: this is a great success for our outstanding community! 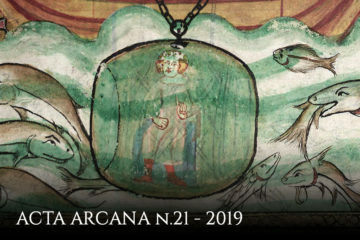 In the next 28 days, our staff will be working on making Lex Arcana known to even more Italian and international gamers. This will be done through videochats, online and live game sessions, interviews, articles, reviews and sharing on social media. We certainly need all the help we can get: the more we are, the better the project will be when completed! You can help us by voting our project on Kicktraq only a click needed! Special thanks go to the authors and artists who are were by our side during this launch, and who are giving the whole project great media coverage and fantastic content: Antonio De Luca and his group of artists, the Imperial Cartographer Francesco Mattioli, Sergio d'Innocenzo and the superb talent of Alessandro Marmorini, who gave his voice to the Emperor himself, Gerard Cristopher Klug, Laura Cardinale, Marco Rafalà, Mark Rein-Hagen, Gareth Hanrahan, David Esbrí and all the other writers we haven’t revealed yet. 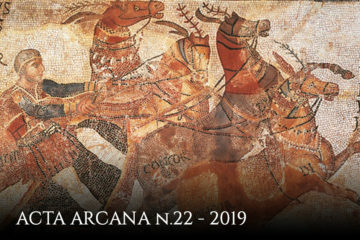 We also thank the original Lex Arcana authors for their work and for trusting us: Francesco Nepitello, Marco Maggi, Dario De Toffoli and Leo Colovini; all other partners and friends: Nicola De Gobbis and the Need Games staff, Roberto di Meglio and Cristoph Cianci from Ares Games – for their logistics support and advice; IoGioco, Gioconomicon, Weirdletter, Cronache del Gatto sul fuoco, Morgengabe, La Civetta sul comò, Casa Kilamdil, Gdr Unplugged, Il Salotto di Giano, APS – La Tavola Rotonda, La costola dei barbari, I cercatori di Atlantide, Rinnegati.net, Librogame's Land, Caponata Meccanica, GDR Italia, Io gioco di ruolo, Infoludiche.it, Magister Ludi, Fantasika, EnWorld e GeekNative, Giulia Bernardini, Livia Alegi, Lorenzo Fantoni, Davide Mana, Antonio Rossetti, Michele Bellone and everyone else who has supported and helped us in any way. Finally, we’d like to point out that the Early Eagle Pledge (which includes the Demiurge Pack complete with all accessories in PDF and PRINT version) only lasts for a few more hours: take advantage of it while you still can! See you soon for new updates on this extraordinary campaign! Q: How can I select Italian or English language? A: At the end of the campaign, you will receive a survey to finalize your choices. At that point, you will be able to select the language of the products you will be receiving. Q: What if I want both versions? A: You can select 2+ types of Pledges, or the same Pledge 2+ times. 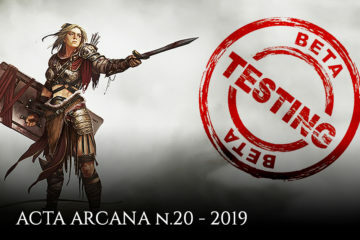 In the survey you will receive at the end of the campaign, you will be able to specify what you would like to receive. Q: Will I receive all my rewards in just one shipment? Q: If I select the Italian version to be shipped in my country or the English version in Italy, will the shipping fee change? A: Shipping fees only concern your address, not the version of the game you select. Q: If I Pledge more than one copy, will shipping fee change? A: Shipping fees will be the same up to 3 shipment “units”. A “unit” is the complete group of physical books and items in a single Pledge Reward AND/OR a single Add-on item.